A new environmental education program bringing the latest research and expertise from the University of California, Berkeley, to the far reaches of the world’s developing countries announced its inaugural call for proposals yesterday (Tuesday, June 5). The program, called “Sustainable Solutions: Teaming Berkeley with Global Practitioners,” is a pilot project intended to bring highly targeted problem-solving workshops to environmental leaders who already have clearly identified issues and strong leadership, but who need support, information and planning at the field level to develop plans of action with achievable and measurable results. The program, funded by The William and Flora Hewlett Foundation, builds on the worldwide network of environmental leaders from the Beahrs Environmental Leadership Program (ELP), an annual summer institute held on campus at UC Berkeley’s College of Natural Resources, that brings together environmental leaders from around the world and has produced two Goldman Prize winners. 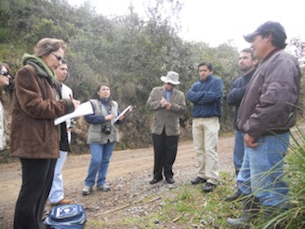 ELP co-director Robin Marsh (left) meets with local farmers and technical advisors from the World Food Programme in Azuay Province, Ecuador. “Our ELP graduates are doing game-changing environmental work around the world and they will be keystones in connecting Berkeley experts with the people and places where we can really make a difference,” said Robin Marsh, co-director of the Beahrs ELP with David Zilberman, a professor of agricultural and resource economics. The Sustainable Solutions pilot is soliciting proposals on topics that include energy, climate science, environmental justice, ecological economics, ecosystems and biodiversity and the social drivers of sustainability, such as community health and labor issues. Marsh and Zilberman will select proposals from two distinct regions of the world that have both a strong ELP-alumni presence and relevant UC Berkeley expertise; those regions include East Africa, South and Southeast Asia and the Amazon Basin. The program is modeled on the ELP’s already successful Buck Kingman Initiatives, small grants for in-country field projects that connect ELP alumni with UC Berkeley faculty. The Kingman Initiatives program has been the ELP’s main interaction with its extensive alumni network. “To expand our impact, we need to develop educational activities on a global scale that will respond to national or regional requests for continued capacity-building support,” Zilberman said. 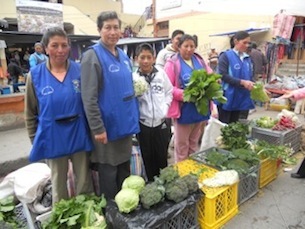 The association of organic vegetable farmers meets in the market of Tulcan, in Carchi Province, Ecuador. They are supported by the local government and the World Food Programme, with which the ELP collaborates. These global partnerships will expand the geographic reach of the University of California’s longstanding practice of bringing research out to communities.“Not only does this program use our network of ELP alumni and serve their needs for more support in their home regions, but it also follows UC’s long-standing Cooperative Extension model, which brings our research out to the communities where it can be implemented most immediately and effectively,” Zilberman said. The William and Flora Hewlett Foundation awarded the Beahrs ELP $50,000 as a seed grant to “prove the concept” that bringing educational and operational support to ELP alumni–environmental and sustainability leaders in developing countries or regions around the world–will result in measureable positive change. Two successful proposals will be selected, and two professors and one graduate student will be dispatched to those regions to conduct collaborative meetings and workshops for five days, resulting in plans of action to implement the solutions the teams have devised. Deadline for proposals will be approximately at the end of July, and proposals will be selected by mid August. Workshops will take place in the window of October 2012 to February 2013. The implementation and monitoring phases will include specific benchmarks and will continue for up to three years beyond the grant period.